Isn't that a beautiful picture? That is what Delaware Park looked like one (1) week ago. I took that picture after a five-minute walk from my house! Ha, ha! Bleak cold wintry day, bleak cold wintry neighborhood! I had to go to the Post Office and they always put post offices in the worst neighborhoods, anyone else notice that? The post office is not happy unless they can drag you into a bad neighborhood, oh no no no. Here is another picture I took stopped at an endless light after running to the Post Office. The reason I went to the Post Office, I was sending a letter to Syracuse University's library to try to get my hands on these letters that Leonard Pennario wrote to the composer Miklos Rozsa. I have the letters Rozsa wrote to him but now I want to see the other half of the correspondence. Getting this letter off to Syracuse took unbelievable bookkeeping and it will probably go nowhere fast. I will probably get a letter back saying I forgot to sign something, or the check I enclosed was not enough to cover postage and taxes, or Box 31 was missing, or something. That is where the letters are. Box 31! But right now I am excited and hoping for the best. This is what floats my boat, the idea of getting my hands on all these letters Leonard wrote to Miklos Rozsa. I just enjoy the letters Rozsa wrote to him so much, I cannot wait to fill in the missing pieces. Here was something funny that happened to me today. I was laughing about it off and on all the way to and from the Post Office. Another thing I did with my research was write to this guy at Capitol Records. I am hoping to find out what happened to several unreleased Pennario recordings. There were not many Pennario recordings that were unreleased, I will say that. Almost all of them were. But there are a few that were not. 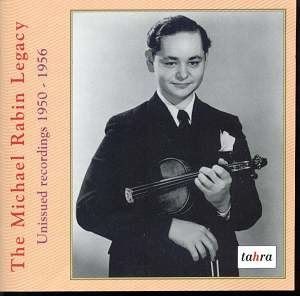 I was poring over the voluminous sessionography that comes from Capitol Records and one of the things that puzzled me was this one session in December 1958 listed with Pennario and this violinist, Michael Rabin. Michael Rabin is not just any violinist. He had a neurological disease and so his career was cut tragically short. Looking back, a lot of people see him as one of the greats. He is like this legend. Here is a picture of the legendary Michael Rabin. And I am thinking, I wish I had known to ask Pennario about him! Which, there are a million things I did not think to ask Leonard about, so I got over that. But I thought, it was a little funny I had never heard of this recording session, anywhere. And I have never come across a record featuring Pennario and Rabin as a duo. Also it seemed funny to see Pennario in that setting because these were violin showpieces, and I do not think even a violinist like Rabin would have been able to get Pennario as what amounted to an accompanist, even though you have to be good to be able to play the piano part to these pieces. These were pieces by Elgar and Sarasate, etc. Then I start reading up on Rabin. And I see mention of a session he did in 1958 for Capitol with a pianist named Leon Pommers. Rabin was a Capitol artist like Pennario. So I start thinking, maybe this was a mistake, and the pianist was Pommers, not Pennario. After investigating a few other possibilities, I wrote a note to the Capitol guy about that. Only later, after I had wasted a lot more time looking up this and that, did it hit me: Of course it was a mistake! Because think of the names written in cursive writing. Someone must have written it into book, written out "Leon Pommers." You have the m's, and the r in the last name. It must have looked like "Leon. Pennario." For sure! Blind alleys like this make up the unglamorous side of my research. Along with trips to the Post Office.